Today, man’s needs for resources are growing in leaps and bounds and technology is hard put just to keep in stride. One of these is the dire need for water. As a matter of fact, in certain places in the world the need has been getting more and more urgent daily. Technology’s answer at the moment is water desalination through reverse osmosis. Reverse osmosis is the process where contaminated water is forcibly passed through a membrane straining the impurities in the water and collecting the clean water. Desalination is a reverse osmosis process where the salt content of saline water is reduced to a usable level. 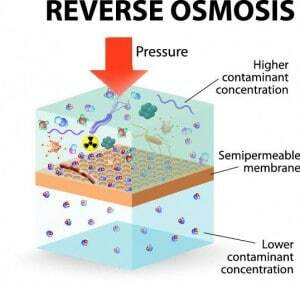 In regular reverse osmosis process, impurities are easily removed from the water. Some substances dissolved in water like calcium carbonate are removed easily, but some like sodium chloride (salt) require more complex methods like desalination. Before, it was difficult and economically impossible to remove dissolved salt from saline water (from sources like sea water or salty ground water sources). In the 50s, however, the economics of desalination finally became viable under certain circumstances. Desalination, the process that reduces the dissolved salt content of saline water to a usable level, entails three liquid streams the saline feed water (brackish or seawater), the low-salinity product water (the usable water) and the highly saline concentrate (brine or reject water). The product water generally contains less than 500 mg/I dissolved solids. This concentration is already suitable for most domestic, industrial and even agricultural uses. In the end, this had solved the age-old problem of coastal communities surrounded by all that saline water but having no way to use them. Reverse osmosis membranes come in two popular types: the spiral wound, and the hollow fine fiber. Generally, they are made of cellulose acetate, aromatic polyamides and polymer film composites. They are all used for brackish water and seawater desalination, albeit the specific membrane and pressure pumps vary according to the pressures fit for each. For desalination using brackish water, the operating pressures range from 250 to 400 psi. (pounds per square inch). Seawater desalination uses 800 to 1,000 psi. Because no membrane is perfect in its rejection of dissolved salts, a small percentage of salt passes through the membrane and remains in the product water. This product water is usually adjusted for pH and degasified before being used for drinking. Degasification is having the water aerated and the pH (acidity) level is adjusted accordingly. Usually, the water is first stored in containers before being used. Desalinated water through reverse osmosis has been used as potable water for industrial and agricultural purposes. Newly-developed membranes are now designed to withstand higher pressures. They are also more efficient now in removing around 60% to 75% of the salt, plus almost all organics, bacteria and other chemicals in the water. This is also used during the manufacture of electronic parts that need water, specialty food, and in the pharmaceuticals industry. In agriculture, greenhouse and hydroponics farmers are now beginning to employ reverse osmosis to desalinate and purify their irrigation water in their farms. One happy bonus they discovered is that their desalinated water has lower counts of bacteria and nematodes. In turn, this greatly helped in controlling plant diseases in their farms. In South America (like some parts in Argentina, Brazil and Chile), reverse osmosis desalination is now being used on a starter scale. It will only be a matter of time when more and more places in the world will adopt this new technology. NEXT POST Next post: What is Transcendental Meditation?